E-voting seems a first world kind of thing. You do not need to visit the voting booth and you can vote with the comfort of sitting at your home. The dates of Lok Sabha assembly elections are announced and political parties have started their campaigns and workshops. Indian citizens are also gearing up for this. But many people are thinking about e-voting in India. E-voting is a process of voting where the internet is involved. It is a remote way of casting votes. To do this one person must have a computer/smartphone/laptop, a stable internet connection, and specific e-voter id. Indian citizens usually vote via the EVM machine. This electronic voting machine is the trusted companion of the voters. The government workers who are living elsewhere or who have polling duty have the option to vote in ballot papers. But still, a whopping number of votes get wasted every year. In 2014 Lok Sabha polls roughly 28 crores votes became wasted. Why this large number of votes got squandered? It seems that a lot of voters are unable to use their fundamental right for electing the political representatives. These votes could have made an impact if the voters could do it. At first, take a look into the possible causes of this wastage. Now, most of the youngsters are migrating for studies. They migrate to different cities or even abroad. Taking leave of 2 to 3 days just to cast a vote is impossible to them in most situations. So, they are unable to vote. Young professionals who are not living in their constituency have also the same problem. They also cannot get leave for casting their vote. Hence their vote is wasted. People with disability cannot go to the booth often. Hence no vote from their end is cast. The elderly people also fail to give a vote, owing to their old age issues. Women who are pregnant or those who are hospitalized or bedridden temporarily also cannot visit the polling station. NRI people cannot vote. But if they are allowed to vote through online mode, the election process will become more transparent. Without a second thought, e-voting is the only way out. This way anyone can vote anywhere. You can be in Mumbai and vote for a constituency in your city, say Kolkata. This paperless option can be a great option for the above-mentioned peoples. • Apps: Govt. or election commission can design an app where a voter can vote. • Websites: a website for e-voting is also great. Anyone can access the website for voting. • Text message: those who do not have internet or Smartphone messenger can also be a type of voting. These apps or websites will be accessible to the voters for a certain period of time and they must vote within the stipulated time. Voters will be given unique e-voter ID or they can vote via OTP. There are many ways and the government needs to choose the best option. • Government officials and working professionals who will not get leave during the vote. • Those who are disabled physically. • Unwell or hospitalized voters. • Those who are abroad or in a meeting. • Those who cannot afford to stand in a long queue. 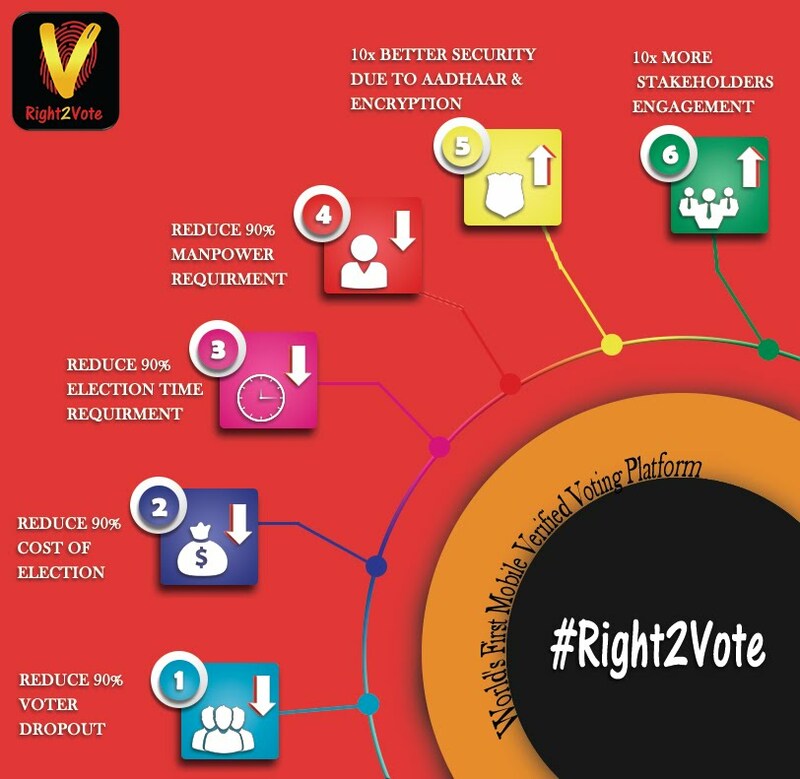 Now, how e-voting helps in India? As mentioned before, anyone can vote through e-voting in India. So votes won't become wasted. The election process will become more transparent. People will become more interested to vote online. So, fewer polling phases will be needed. During elections, many government and non-governmental offices, schools, colleges are made strong room and polling stations. So work and education suffer a lot. If e-voting starts it will help to stop these sufferings. Therefore, to sum up, it can be said e-voting can help to eradicate curbing the vote wastage but a major part of India is not ready for this process. But still, for a section of Indian voters, e-voting is a blessing.